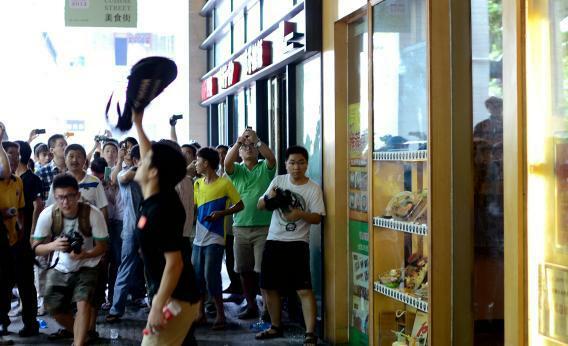 A group of protesters pelt a Japanese restaurant with plastic bottles as they attend a rally against Japan’s claim of islands known as Senkaku in Japan and Diaoyu in China last week. The most recent dustup between China and Japan in their long-running dispute over ownership of the islets of the South China Sea has brought forth a new wave of coverage and vitriol, most of which is caused by the imperious way China is simply claiming as its own territory a good chunk of the coastline along the Pacific Rim of Asia. The story hasn’t changed much in recent years, except that China has raised the temperature. China cites dodgy historical data and old maps (including the notorious “nine-dotted line” drawn up by the old Nationalist government) to lay claim to an area of open sea—some of which may sit over oil and gas reserves—the size of the Western United States. Worse, China—in keeping with Asia’s fetish for sovereignty over multinational mediation—refuses to discuss the issue and has recently escalated its disputes by naming a “regional government” for what otherwise seems more rightfully the realm of Neptune. But what worries me is the relative complacency of the United States. As Democratic Sen. James Webb of Virginia pointed out this week in the Wall Street Journal, the United States has acted extraordinarily slowly to condemn China’s decision to raise the temperature of the dispute. Secretary of State Hillary Clinton has raised the issue in public statements, but real pressure to convene a regional conference has been absent. Beyond lip service, there hasn’t been a grand effort to call a conference and thus China’s bluff about its willingness to settle all issues peacefully. The governing Japanese Democratic Party has changed tune. Having come to office four years ago promising to put distance between Tokyo and Washington, the party has done an about face on issues ranging from U.S. troops in Okinawa to the support Japan would offer in case of a crisis over Taiwan. The Philippines is even asking us to return to Subic Bay and Clark Air Force Base, the colonial-era facilities it ejected us from in the early 1990s. The United States should not overestimate its influence at this point or confuse the interest smaller Asian countries are showing in American military friendship with actual trust. Webb, a Marine combat veteran of Vietnam and former secretary of the Navy, correctly states that the huge forward deployment of the U.S. military, especially the Navy’s 7th Fleet, maintains a crucial balance in the region, “providing the so-called second tier countries in the region [read: Japan, South Korean, Taiwan, Indonesia, Australia, and the Phlippines] the opportunity to grow economically and to mature politically. Fatality figures are imprecise for such conflicts, but a conservative ranking would go something like this: Vietnam (1962-1973) 3.5 million deaths including 57,000 U.S. troops; Korea, (1950-1953) 3 million fatalities, including about 37,000 U.S. combat deaths; India-Pakistan, about 1 million deaths. (As you may have gleaned, most of those killed in all three wars were not in uniform). If the United States wants to make a difference in Asia, it will need to get serious about bringing China and its neighbors to an international conference. The UN, stymied by the outdated P-5 veto, will once again prove useless (as I’ve argued over and over). But the United States needs to take steps while we still have the influence to force a multinational dialogue. Otherwise, events will be driven by zealots who dive out of small craft and plant flags on uninhabited islands—risking a chain of events that puts millions of lives at risk. Correction, Aug. 22, 2012: This article misstated the source of an article on conflicts in the Pacific Rim. It was written by the Associated Press, not Washington Post reporters, and published in the Washington Post. Additionally, this article misstated the number of people killed in the Vietnam War. The estimatd number of deaths was 3.5 million, not 3,500.